Oh, Positano. On our journey from Naples our driver kept pronouncing Positano to be “paradise”, which we found amusing until we finally saw it, and were stunned! When we visited the Amalfi Coast, we chose Positano as our base. I think we made the right choice as it’s incredibly picturesque, the restaurants and hotels are great, and it’s much less touristic than the other towns e.g. Amalfi. Transport links are also very good (ferries and buses depart from here), although be prepared for typical Italian scheduling! There are quite a few hotels in Positano to choose from, but beware because they book up fast! When I booked there wasn’t much choice left, but I managed to get a room at a hotel called Eden Roc. It turned out to be a lovely hotel and I think the cleanest room I’ve ever stayed in (the floors and even the balcony were scrubbed daily)! If you can, try to get a room with a balcony – it’s definitely worth it. I’ve never sprung out of bed so eagerly than in Positano to fling open the balcony doors and take in the view every morning. Our travel was to and from Naples. We had spent the previous night in Naples, and needed to go to Naples airport to fly back to London. The only way to get there directly is via private transfer (pre-booked taxi), which I’d definitely recommend as your time is precious! Plus, the one-hour drive is really spectacular and a great introduction/goodbye to the Amalfi Coast. There are tonnes of private transfer companies – we used Positano Tony Taxi. We also had the option of driving ourselves from Naples, but I am so happy we did not! 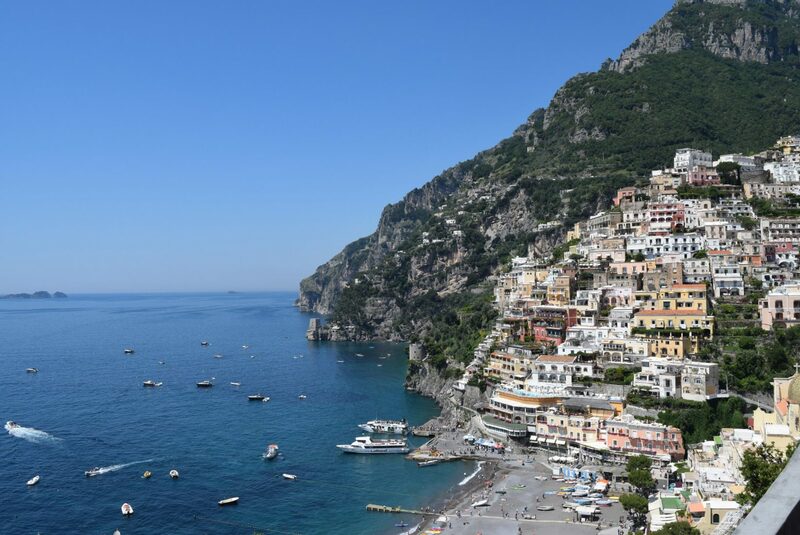 It’s pretty easy to get around the Amalfi Coast via bus, ferry and taxi, so I would not recommend driving yourself unless you are completely unafraid of heights and narrow winding roads carved into cliff faces! Positano and the Amalfi Coast are famous for their lemons. The varieties here are enormous! Cool off with a lemon sorbet served in an actual lemon which you can get next to the ferry area, and don’t forget to sample the limoncello. Have a healthy lunch at Positano favourite Casa e Bottega and enjoy a salad and a smoothie. No reservations, but double check they’re open before you go as they have seasonal opening times. The inside of the cafe also has home furnishings you can buy and there’s an amazing view..
Al Palazzo was my favourite dining experience in Positano. As with all Italian restaurants, the menu is seasonal and ingredients are fresh. Reserve a table outside in the courtyard garden which has a large variety of flowers, and a view of the beautiful hotel. Perfect for a romantic dinner. Franco’s Bar is a relatively new bar with a younger, trendier vibe than the other bars in Positano. Be wary of seasonal opening times – we arrived just on the day the bar opened for the summer. Service is excellent and the view is amazing. A relaxing end to the day! Positano itself is quite small, and is easily explored within a few hours. There are quite a few shops and art galleries and if the weather is hot you can rent a bed on the main beach. As we used Positano as a base, we took day trips to neighbouring towns. See the posts on our day-trips to Capri and Ravello. We also did spend time in the town of Amalfi, although to us it was far too touristic and lacked the charm of the other parts of the Amalfi Coast. I will definitely be visiting the Amalfi Coast again! There was not enough time to take it all in. One major activity we missed was the hike along the Sentiero degli Dei, which is high up in the mountains. The day we had scheduled to do it, the weather was extremely bad and the mountains were enveloped with clouds!